PennsylvAsia: Japanese-American film Oh Lucy! in Pittsburgh, from June 15. Japanese-American film Oh Lucy! in Pittsburgh, from June 15. 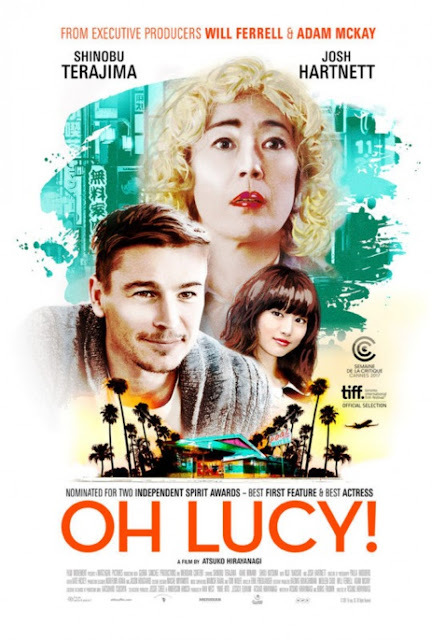 The 2017 Japanese-American film Oh Lucy! will will play in Pittsburgh from June 15 through July 5. A Variety review summarizes the film, starring Shinobu Terajima and Josh Hartnett. Set in some of the least picturesque corners of Tokyo, “Oh Lucy!” is a character study about a character rarely seen on film: a quietly miserable, single, middle-aged Japanese wage-slave. Setsuko (Shinobu Terajima) is a woman with few obvious qualities, and even fewer opportunities, friends, lovers, or interests. A withdrawn, chain-smoking loner in an office culture built on forced displays of camaraderie, her workday begins when she witnesses a suicide on the subway, and continues as she watches an aging employee on the verge of retirement soak up the condescending affection of her coworkers, all of whom are quick to make fun of her once she leaves the room. The subway jumper, the lonely old pensioner – it’s clear that Setsuko sees these as her two most likely options. Her life gets an unexpected jolt after a visit from her fun-loving twentysomething niece, Mika (Shioli Kutsuna) who badgers her into signing up for English lessons with an unconventional tutor. The movie will play at the Harris Theater downtown (map) from June 15th through the 21st, and at the Regent Square Theater (map) from the 22nd through July 5. General admission tickets are $8---students and seniors $7---and are available for purchase at the theaters.